The presence of a repository management system may dictate special handling needs for files. For example, some files should be omitted from version control. Some providers have special handling for text vs. binary files. The team plug-in defines extension points that allow other plug-ins to provide information about their file types. In all cases, special handling is ultimately left up to the user via the team Preferences page. These extensions allow plug-ins to seed the preferences with values appropriate for the plug-in. 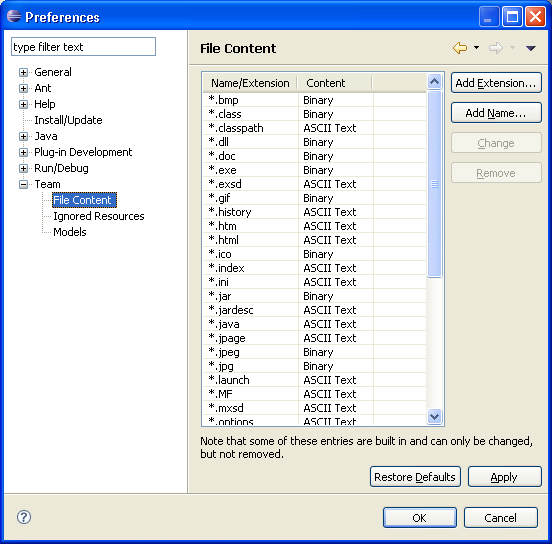 The markup simply declares a file name pattern that should be ignored and a selected attribute which declares the default selection value of the file type in the preferences dialog. It is ultimately up to the user to decide which files should be ignored. The user may select, deselect, add or delete file types from the default list of ignored files. The markup lets plug-ins define a file type by extension and assign a type of text or binary. As with ignored files, it is ultimately up to the user to manage the list of text and binary file types.